You can Save Money and Time with this Cheap Way To Strain Yogurt. No messy cheesecloth or expensive equipment required! This method of turning regular yogurt into Greek yogurt uses commercial paper coffee filters and a plastic dollar-store colander. No expensive colander needed. Some people say using cheesecloth to strain yogurt is not that much trouble. I disagree. Yep! I’ll admit to loving shortcuts and even a bit of laziness when it comes to kitchen clean-up. I would rather spend time at the cutting board or the stove. Own several pieces if you make a lot of yogurt (1 1/2 gallons) at once like I do. No thank you. I prefer a disposable solution or the dishwasher for the task. My go-to straining system has always been a high-quality bouillon strainer, but my favorite one is pricey. Typically, it works great until you make a batch of thin yogurt that flows right through it (sad face). To those of you who have already written to me suggesting coffee filters: I assumed you were talking about the little ones I use every morning to make coffee. It goes without saying that it would take me forever to strain a gallon of yogurt with that size filter. Being a woman of action, the very day I read about Doreen’s method, I went looking for large paper filters. My local restaurant supply stocks 13 x 5-inch filters designed for a 1-1/2 gallon coffee brewer. Purchase them here if you like. In addition to the coffee filters, you will need a colander. The dollar-store variety works just fine. In fact, you can even use the basket part of your lettuce spinner if you like. The whey from straining yogurt through a coffee filter contains no visible solids. No solids are lost (see picture above). It’s inexpensive. For example, my cost was $1 plus tax for orange colander and less than 3 cents per filter. I use 2 filters to make a double layer for ease of handling yogurt. 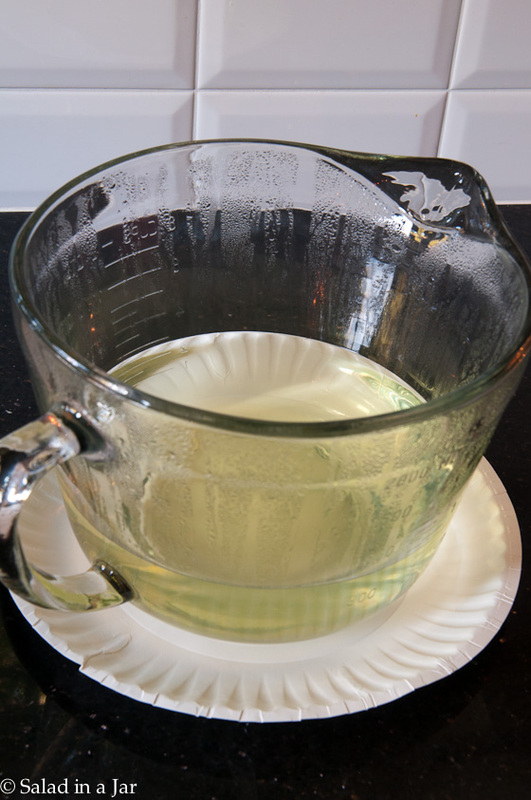 Strained yogurt easily separates from the paper filter for quick clean up. Cheap colander or a colander-substitute works fine to hold paper filter. Strain 2 quarts of yogurt at a time (using 13 x 5 inch size filter). This is the thick Greek yogurt (unstirred) of my dreams. P.S. I do not place my yogurt in the fridge to strain. Contrary to what Doreen does, I leave it on the counter. In my experience, yogurt strains faster at room temperature. The yogurt is acidic enough to sit safely on the counter for several hours. In my mind it’s makes the most sense to strain immediately after incubating. I have a new method to strain yogurt that I think is the best yet. Read about the Kleynhuis yogurt pouch here. It is the fastest way yet and clean-up is super easy! My friend suggested I use Chux which are a washing up cloth. They work really well and can be rewashed multiple times. I don’t know if they are called that in other countries? CHUX® Biodegradable Superwipes® are made from 100% natural and reneweable viscose cellulose fibres. Viscose cellulose, is a naturally super absorbent fibre, with one Superwipes® absorbing up to 10 times its own weight in liquid. Hmmm. This is very interesting. In America, when you say “Chux,” we think of bed pads. And they are super absorbent. But the idea is that no moisture will leak through onto the bed. So this clearly is something different. Maybe same brand/company, but a different product? I’m skeptical of anything that absorbs 10 times it’s own weight. I want the whey to strain right through. I have discovered a new product that works fantastic and I would assume, last for years although I haven’t had it very long. Planning to blog about it soon. Thanks so much for writing Sherrill. I learned something new today. Hi Paula. Do you have a recipe for your cold brew coffee? I have seen several post, but I love your blog and recipes so much. 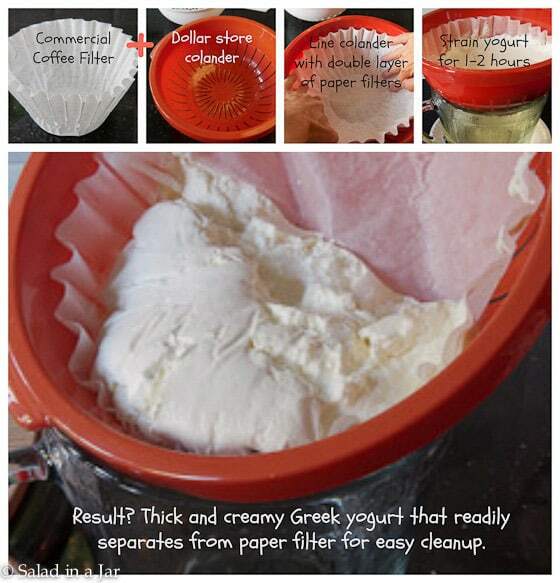 Thanks for sharing your Icelandic yogurt recipe and where to buy industrial size coffee filters. My recipe is basically a knock-off of Pioneer Woman’s recipe. I add 12 ounces of fresh ground coffee to 6 quarts of water. Stir and let it sit on the counter for about 24 hours. A little more or less is no big deal. Strain using large coffee filters inside a cheap colander. Store in Mason jars in the fridge up to 3 weeks. I put my yogurt into large nut milk bags, hang them on my cupboard door knobs, and put a bowl underneath. Perfect! Need some quick ricotta cheese? Use the drained whey from your yogurt. Fill a coffee mug halfway with milk. Add about 1 inch of whey and stir (4 parts milk to 1 part whey). Microwave until boiling (watch out for boiling over). Pour contents of mug into a funnel lined with a coffee filter. If you have one a plastic manual drip coffee maker works even better. When the whey drains out what is left in the filter is the best and quickest ricotta you ever saw. Even more decadent is to add a little heavy cream before boiling. Recipe can be made larger, just use the 4 to 1 milk/whey ratio. I have seen recipes online where you can make ricotta from just the whey. It doesn’t work. Apparently yogurt uses all of the milk protein. Dairies that use whey to make Ricotta use the whey from Mozzarella, which only uses some of the milk’s protein. The coffee filters are a good idea, but I think the difficulty of using cheesecloth is greatly exaggerated. I use a piece big enough to fold in half and still easily cover the collander. I keep it in a zip lock bag. At straining time I dump to yogurt from the incubation pot into the large cheesecloth lined collander. The collander sits in a large salad bowl to catch the whey. When the desired amount of whey has drained, pick up the cheesecloth by the corners and set it in the salad bowl after dumping the whey out of it. Pull on two corners of the cheesecloth and the yogurt flips right into the bowl. Usually none stick to the cloth. 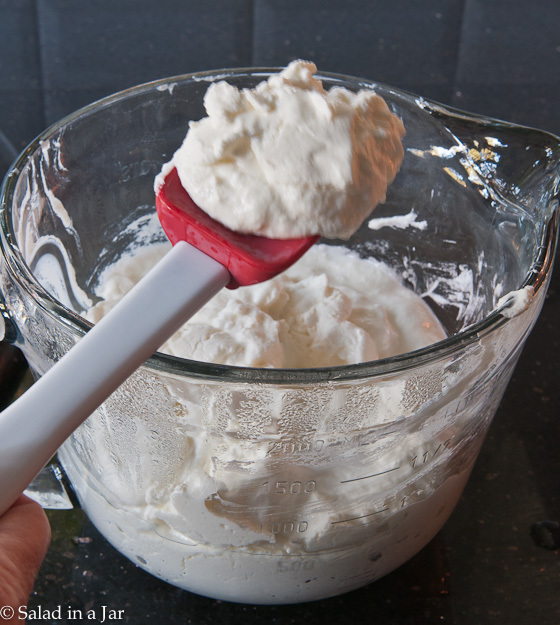 Stir or whip yogurt and scoop into small containers. I use 4oz strofoam cups from the restaurant supply (about $3 for 50 and I reuse them, too). Now the easy way to clean the cheesecloth. Rinse good under hot tap, squeege a few drops of dish soap onto the cloth, squish it around in your hands for a few seconds and rinse real good. Stuff to cloth into a coffee mug, fill with water and microwave until water is boiling. Cheesecloth is now clean and sterile .Put it on a clothes hanger, or something like that. When dry fold and put it back in the ziplock. Done. I know this might seem complicated but it is only about a minute from first rinse to microwave. And while it dries, you don’t have to be there. And cheesecloth never tears. I usually make a gallon at a time. I have found that lining a colander with paper towels works well for larger quantities. Somehow I tend to make a mess with paper towels. They aren’t shaped right. 🙂 But if they work for you–fantastic! Ok, this was sheer genius. I could not find a cheap source for the filters and ended up paying about $23 including shipping for 500 of them. I had my ancient Tupperware colander and the perfect size bucket for it to sit in in my fridge. I used two filters as you suggested but I might try one next time just to make them last longer, but not if it is more of a hassle. This is way faster then having to thoroughly clean the very expensive bouillon strainer. Just a quick rinse of the strainer/bucket and I am done. I make the yogurt and strain it for both me and my mother so I am constantly making and straining yogurt. Thanks for the new info. I do use my strainer for other things so it won’t go to waste but for those that don’t have one, this is a great alternative to strain two quarts at once. Sorry you had to pay so much for those filters. Maybe you can find some at a restaurant supply before you need to buy again. Surely they would be cheaper. why not use kitchen paper towel on a tea strainer. of course some amount attached to the paper will be waster. Great idea! I never thought about using commercial sized coffee filters. I will look for some. So, you are cold brew coffee convert, too? I tried it about a month ago, and I am sold. I love the convenience, the mellow coffee flavor, and the decrease in acid. My stomach is loving it, too. Quick question…Do you use the whey for anything or just discard? Thanks for getting back to me on this…just about to make a batch of yogurt this week. Helen, Here are some ideas for the whey. Great stuff, will give it atry. (I learnt to make yogurt a few weeks before I found your Swedish Apple Pie that led me to your blog, but I’m “whey” in love with your yogurt posts since there’s always something new to learn.) I’ve been straining yogurt like Ina Garten did in one of her shows; lining a regular colander with paper towels, just on the countertop to thicken it a little bit for a cake recipe. I also strain it overnight in the fridge for fear of the summer temperatures here that soar to 40+ degrees celcius. This is how I do it as well. I got my larger filters at Sams Club. However, I usually use three filters to line my colander. One is not big enough. Maybe my colander is larger. I also strain it in the fridge…but I strain overnight. Hi CSMom, I suspect my filters are larger than yours. They will hold two quarts of unstrained yogurt. My restaurant supply had at least 3 different sizes and I bought the largest size. Didn’t even think to check Sams. I’m going to check Costco on my next trip and see what they carry. Surely cheaper than buying online.